Linda Hoye, one of my sisters in Story Circle Network, reminded me today that SCN’s Stories from the Heart Conference 2012 will take place April 13-15, here in Austin. She’ll be there. Sisters I’ve met in person or online will be there. Sisters I would like to meet will be there. I’m dithering. But I think the answer is Yes. You see, I attended the 2008 conference and benefited in ways I can’t begin to describe. In 2010, however, citing fiscal responsibility and restraint (aka saintly self-denial), I did not attend. Later, I told a friend it was a good thing I hadn’t arranged to go, because on the weekend of the conference I was sick in bed. She responded, “You were sick because you didn’t go to the conference.” She was right. 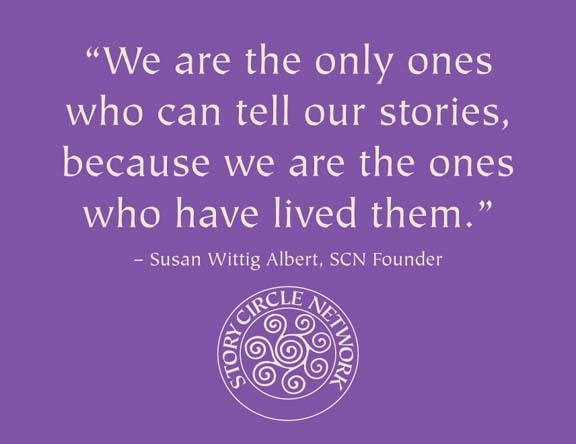 Story Circle Network, a nonprofit organization with an international membership, exists to help women write their life stories and share them with each other and with posterity. Conference workshops focus on ways to get those stories onto the page. There’s a keynote speech by a noted author, and social hours, and a farewell luncheon with entertainment, and an evening of sharing at an open mike. I could go into detail, but I won’t. All the information is on the webpage. Anyway, some things can’t be scheduled. The most memorable moment of the 2008 conference wasn’t on the program. It happened Saturday evening where a dozen or so strangers were gathered around a table in the hotel restaurant, having dinner and talking about our lives. One of the women, Jean, said she had moved to San Antonio in the aftermath of Hurricane Katrina. She had been traveling when the hurricane hit, and her home in New Orleans had been spared, but at her age, she could never feel secure living there again. She was seriously depressed; she had lost her home and way of life, the relative she had come to live with had died, and no one could understand the trauma she had experienced. She felt hopeless. Midway through the meal, the restaurant manager, a tall, young African-American woman, stopped by the table to make sure service had been adequate. She asked about the conference. One of the diners explained why we were there and invited her to write with us. I was in New Orleans when Hurricane Katrina hit. I managed the food services at a nursing home for elderly nuns. We helped get the nuns evacuated, but there was no room for anyone else, so all the staff stayed behind. Some of the people had gone and gotten their children, so they were with us, too. When the water began to rise, we went upstairs, but the water kept rising, so we got on the roof. We were up there for days, with helicopters going over, and us waving and shouting, but they ignored us. When the waters went down, some of us went looking for food, because we had nothing. We waded through the flood to a grocery store where we found some bread, and we carried it back, but our legs broke out in ulcers from the chemicals polluting the water. When the helicopters finally landed, they wanted to take the children, but we said, No, if you take the children, we’ll never see them again. We kept the children with us. We were up there for two weeks. When I finally got out, I found my brother in Chicago and went to him, but the city was too big. I needed somewhere smaller and more like home, so I came to Austin and got this job. But I can’t forget, and nobody here really understands what I’ve been through. When she stopped talking, the room was hushed. We must have looked like wide-eyed children listening to a ghost story. Then someone said, “There’s a lady here who needs to talk to you,” and led her to Jean. Later, discussing what had happened around that table, one of the listeners called it holy. That’s exactly what it was. And that’s why for all my dithering, I really have no choice. I’m going to have to say Yes. Amazing story, Kathy. Two weeks–I can’t even imagine that. It was amazing. Both the story and the circumstances under which it was told. We were all sort of breathless, hearing the story and knowing it was being told at just the right time and place. I was at that conference too, but stayed with my daughter a few miles away so I missed that dinner. Two highlights for me were Nancy Aronie’s keynote and the final program where we learned about Hildegaard and her chanting. I had such bad laryngitis going into that session I could barely whisper. I began mouthing the tones, letting whatever air would escape, but forcing nothing. By the end of the program, my voice had fully returned, clear and sure. Wow! This year I had a choice: Machu Picchu or Stories From the Heart. I’ll think of you as I survey the glories of Machu Picchu. Looking forward to hopefully meeting you. I’ll be there, too. I’m so pleased! I’d hoped you would be there, but thought you might be staying over in Tucson.